As Hesketh Pearson put it, ‘Misquotations are the only quotations that are never misquoted.’ To see if he’s right, we’ve compiled a Top Ten list containing what we think are the commonest expressions in English which are misquotes of their original literary idioms. How many of these did you know started out as something different? And do you think that they are still ‘misquotations’, if the phrases go on to gain a new life of their own? When does a misquote become simply a quote, or something more universal – a ‘saying’ or expression? Oh, and have we left off any good examples of literary misquoting? 2. Abandon hope, all ye who enter here. This translation from Dante’s Inferno – the words are inscribed above the entrance to hell in the medieval poem – is a misquotation of H. F. Cary’s 1814 English translation, ‘All hope abandon ye who enter here.’ It was probably misquoted because the misquotation rolled off the tongue better. 4. Alas, poor Yorick! I knew him well. This is Hamlet’s exclamation when he is confronted with the skull of the jester who had entertained him when he was a young boy. That last word should be ‘Horatio’ rather than ‘well’ – but for one reason or another the name of Hamlet’s trusty friend is left out of the usual quotation when it is uttered by people (usually, and aptly, in jest) and the word ‘well’ is brought in to round off the phrase. 5. Pride goes before a fall. Another telescoping of a longer expression, this time from the Bible: ‘Pride goeth before destruction, and an haughty spirit before a fall’ (Proverbs 16:18). As with the previous example, this is probably because ‘pride goes before a fall’ provides a shorter and snappier variation on the original, longer phrase. 6. Hell hath no fury like a woman scorned. This oft-used phrase originated in a couple of lines from William Congreve’s 1697 play The Mourning Bride: ‘Heaven has no rage like love to hatred turned, / Nor hell a fury like a woman scorned.’ Congreve also appears to have coined – or been one of the first to use – the phrase ‘kiss and tell’, in his 1695 play Love for Love. 7. Britannia rules the waves. In the patriotic British anthem, the line is actually ‘Britannia, rule the waves’, with the second word being in the imperative mood rather than the indicative. 8. Water, water everywhere, and not a drop to drink. The actual line from Coleridge’s The Rime of the Ancient Mariner is ‘nor any drop to drink’. For more on Coleridge’s classic poem, see our post about Coleridge here. 10. Elementary, my dear Watson. As we’ve discussed in our previous post on ten facts about Sherlock Holmes, this expression doesn’t appear in the original Sherlock Holmes stories by Sir Arthur Conan Doyle, and first turns up in literature in a novel by P. G. Wodehouse. Complimentary, my dear Wodehouse! 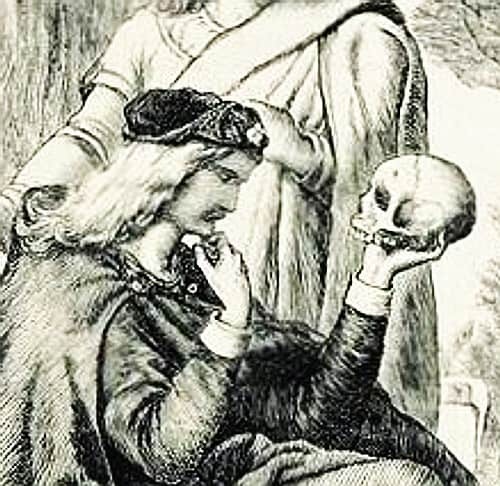 Image: Hamlet and skull, Wikimedia Commons, public domain. I didn’t know ‘God helps those who help themselves’ wasn’t in the Bible – interesting! Lead on Macduff. Originally “Lay on, Macduff,/ and Damned be him that first cries ‘Hold, /enough! '” (Macbeth 5.8.33-35 Ed E. B. Harrison. New York: Harcourt). I suppose if one is being really picky, the misquotations are no longer misquotations when they are being quoted for their own sake. However, at what point do these mis/quotations actually lose their vigour and become dead cliche? Great posting thanks! Another one to add, from Shakespeare’s “The Merchant of Venice”: All that glitters is not gold, is in the Shakespeare, All that glisters is not gold. I wonder if anyone ever meant “Me Tarzan, you Jane,” as any kind of quote at all, or simply a reference to the ‘Tarzan-type’ mentality of chauvinism. Yes, I suppose it is more a snappy summary of male attitudes. Good point! These are great; I only knew a few of them. One that drives me crazy is more of an elimination of context than a misquote: people saying “Now is the winter of our discontent” without the line that follows, which completely alters the point of the statement. I agree about that Richard III quotation – it always gets quoted as though it’s a self-contained, negative statement, rather than a statement about bad times turning into good. Thanks – glad you enjoyed it! very interesting trivia. Thanks for putting that together. Great post, I’m standing ready to infuriate people by correcting them! I believe that some of these have come into their own as phrases, namely ‘Abandon Hope All Ye Who Enter Here’. I have seen it used in various shows/movies/art over several genres in that layout. Thanks, and thanks for this excerpt, Russell! “Far from the maddening crowd” is one that always makes me turn away with a look of haughty disdain. Great list! A few I did not even realize were quotes. There is a statement in The Man Who Shot Liberty Valance, which goes like this, ” If the legend is better than the history believe the legend.” We are constantly believing the myth. Also noted, Sam was never asked to play it again in Casablanca. Correct. We hear what we think we hear and that is the problem, Houston. Better place to land then Instagram. Reblogged this on Oh Faulkner. And why the sea is boiling hot and whether pigs have wings. I’ve probably mangled the punctuation. another you could add to the list is “play it again, sam,” from the movie “casablanca.” bogart never says it. he says, “play it, sam.” i guess the original just doesn’t have the same ring to it. thanks for this great list, and for liking my latest post. I love this work. You really make it. Nice. Thanks for the follow. I’m following back. I am glad I found your blog. We have similar interests. I love quotes but it does kinda drive me crazy when people use them out of context. Interesting Literature Blog. . . proving that the literary pop culture quotes we use are wrong.